Give your dog something constructive to do so he doesn’t choose something destructive to do! Save your washing, your plants and your backyard. 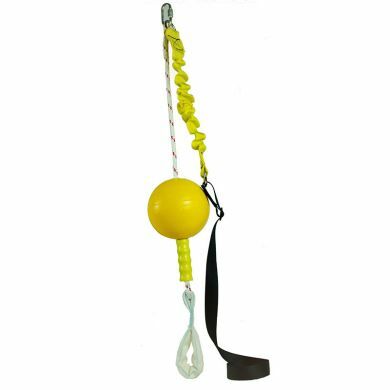 This super tough bungy tug of war toy springs back up when released so your dog will be enticed to try to catch it again. For extra stimulation you can add food in the ball which will rattle and dispense during play. This toy was developed with the help of Dr. Robert Holmes BVM&S PhD FANZCVS MRCVS (That’s a lot of letters! I looked him up and he’s a a qualified vet based in Melbourne with PhD in animal behaviour and lots of experience) especially for dogs who are left home alone during the day. Great toy for rough playful dogs. Hard wearing even for dogs who are really tough on toys. Hangs from a tree or other higher elevation spot. 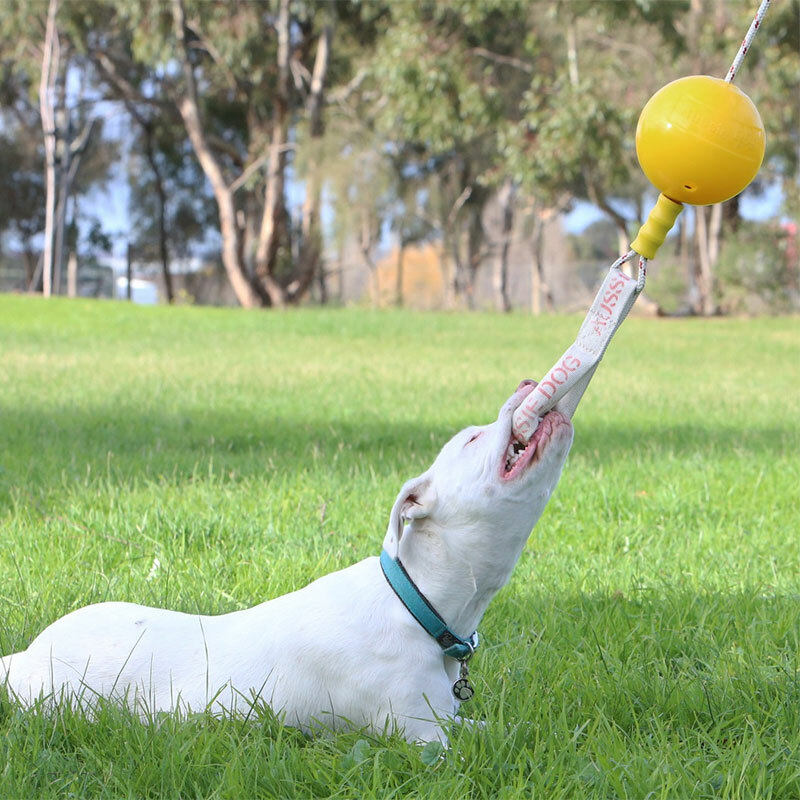 Unlike most dog toys it’s designed for your dog to use when you’re not there. 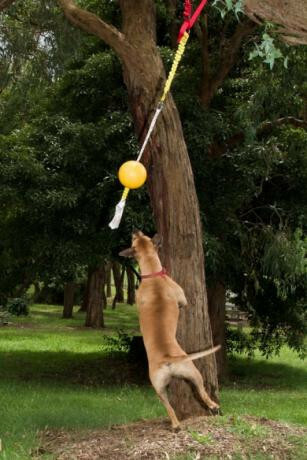 Gives anxious or destructive dogs an activity to keep them entertained. We love the Waggle Aussie Dog Home Along toy! We actually got it to use at work, as poor Milo gets bored while we are sitting here, working away. So now he has the Home Alone to keep him busy and we don't have to worry about him. It's the best toy, because, as a determined 8month old, Milo is very competitive and determined to always succeed, so the Home Alone keeps him very, very occupied! 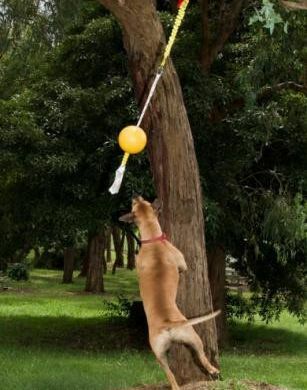 Great for dogs that don't quit! I ordered the Aussie Dog Home Alone toy and I was surprised with how quickly my delivery arrived! My Border Collie (Archie) & Labrador (Hugo) absolutely love it. Being young & very active dogs I do have concerns about the durability of the toys that I give them but this one is definitely built to last. It keeps them occupied for hours while I am at work. The staff at waggle.com.au are also very friendly & helpful. Definitely 5 out of 5 stars! Very impressed! Read 3 customer reviews of Aussie Dog Home Alone. The average customer rating is 4.3. My 7 month old Weimaraner plays with this if I am there to play with her but otherwise isn’t particularly interested, despite treats hiding inside. Seems well put together and strong. Highly recommend the Aussie Dog Home Alone toy for all dogs!